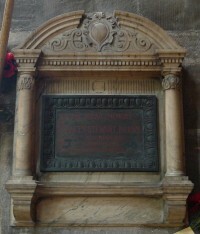 John Honeyman & Keppie designed a cream marble Doric Roman-style aedicule monument with broken curved pediment, and bronze memorial dedication panel to commemorate Frances Stewart Burns (1833–95), wife of Dr George Stewart Burns, minister of Glasgow Cathedral from 1865 until his death in 1896. The memorial is located on the N. wall of the Cathedral's N. transept. The combination of styles in the carved marble and bronze details; the Classical stema or shields; 17th-century strapwork; and Art Nouveau bud-like forms, recall decorative work at other contemporary John Honeyman & Keppie projects such as the wrought-iron gates at Queen Margaret College Anatomical Department. 1: George Eyre-Todd, ed., The Book of Glasgow Cathedral: A History and Description, Glasgow: Morison Brothers, 1898, pp. 443–4.